"Pairs wheat germ and whole-wheat pastry flour for a healthy, wholesome breakfast treat. If you use a Teflon griddle you do not have to use oil." In a medium bowl, mix eggs with oil and buttermilk. Stir in baking soda, wheat germ, salt and flour; mix until blended. Heat a lightly oiled griddle or frying pan over medium-high heat. Pour or scoop the batter onto the griddle, using approximately 1/4 cup for each pancake. Brown on both sides, turning once. I used flax seed instead of the eggs. 1 T. ground flax + 3 T. water replaces one egg. More healthy! Thanks for the recipe! I liked this recipe but one time, on accident I left out the oil and they came out even better, more fluffy (and I saved calories). My brother requests these every Saturday. 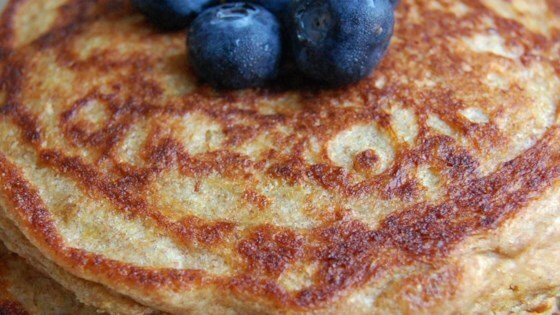 Fluffy, clean-tasting delicious pancakes! I used ground flaxseed instead of wheat germ and 1/2 c yogurt + 1 1/2 c milk for buttermilk and my parents loved it. Definitely a keeper.